Some orders may require choices such as main protein, condiments, sides. You can set these options from the Orders page on the control panel. Click on Orders and select Modifiers from the dropdown. Add modifier groups based on your needs as shown below. You can add as many modifier groups and as many modifiers as you need. Then, go into your menu and find the item you want to add modifiers to. Click on Edit and enter the Item Details. You will see a slot for Option Sets. Here, you can select from the Modifier Groups that you've created earlier. You can make certain modifiers required, such as the choice of protein and configure the max/min selections. When a modifier group is required, guests can't complete the order without making a selection. When you set the max number of selection as 1, it will allow your guests you choose only 1 from that modifier group per order. After configuring your modifiers, publish changes to your devices by clicking the lightning icon at the top of the screen. 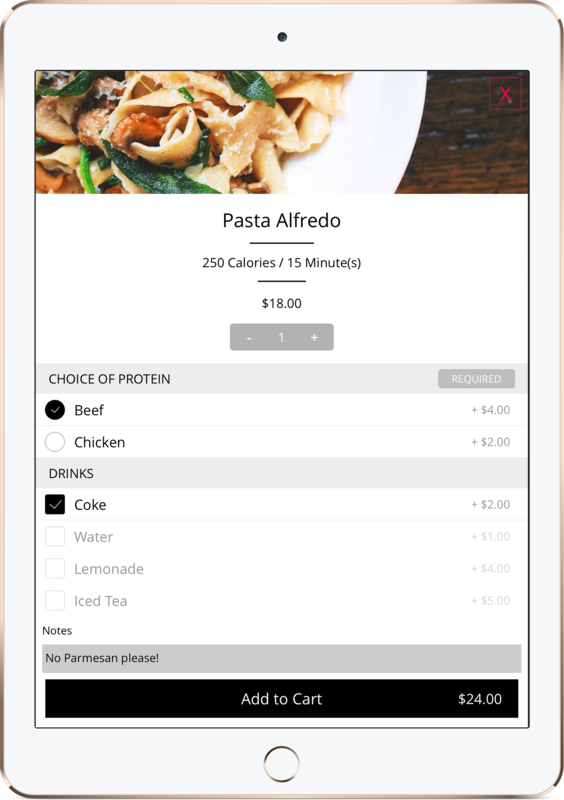 Now your guests can modify their orders within a few seconds!